Eugen was born on Corellia . His mother taught him to pilot and how to deal and negotiate with others. After he completed school in Coronet City , his mother gave him a ship as a present for graduation. The ship was a old X-Wing . Shortly after he received the ship as a present from his mother , a friend of him taught him how to wield a vibroblade and fire a blaster, something very useful if one was to travel across the galaxy . After this Eugen asked his mother if he could take the ship and explore different planets and learn about the locals habits and languages . His mother hardly accepted since she didn’t wanted to “lose” another child . After turning 15, Eugen travelled across the galaxy, visiting places such as Kashyyk, where he learnt to understand Shirwook, the language of Wookies, or exotic place such as Korriban. Another notable places would be Dantooine, Tatooine, Ryloth and Nar-Shaddaa. 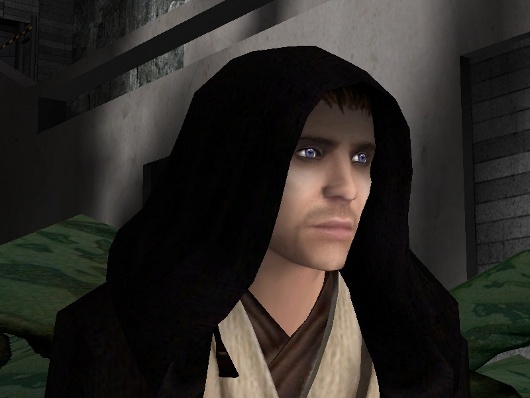 During his stay on Tatooine, he studied the language of Hutts, while on Ryloth, Eugen put efforts in, to study Twi’leki during his lenghty stay. Eugen’s brief visit of Nar-Shaddaa carried somewhat significant event of his life – seeing thugs shooting an innocent Twi’lek, after being harshly tortured. Feeling guilty he couldn’t do anything to prevent that, he wanted to do something of significance, so things like that wouldn’t happen like that, next time he’d see them. At 17 he returned on Corellia , Coronet City , where he met his mother again . During his stay there, he made his own vibroblade and learnt to understand Binary (Droid language) . At 18 he departed from Corellia again.